We want to tell you in detail about the policies and practices which we have adopted to protect your privacy so that you can feel confident about how we handle the personally identifiable information (‘personal information’) you entrust to us, and understand how we manage your personal information to offer you the best possible products, services and experiences. The server(s) that make(s) this site available, and databases where information may be stored, may be located outside the country from which you accessed this site, but we will collect, process and use personal information only in accordance with this policy. The personal information made available to us may, therefore, be transmitted abroad. The content on our sites may include, among other items of interest, entertainment, games, surveys, sweepstakes, and contests, and may also include advertising and opportunities to shop online. We may also provide information on our company and our products, and may also offer opportunities to apply for employment. We hope that you enjoy our site and will come back often to visit! – We use your personal information to fulfill your requests and serve you better. We do not share your personal details with outside third parties without your consent. – We will only send you materials you have indicated you want to receive according to your preferences, and we will honor your opt-out requests. – We adopt careful procedures to protect your personal information, and use special care to protect credit card data you give us when you shop online. – We do reserve the right to use or disclose your personal information in certain circumstances, such as to satisfy a legal request or protect our property. We collect personal information, such as names, addresses, e-mail addresses, hobby or activity information, demographic information (age, gender, etc. ), taste or preference information, and the like, when voluntarily submitted by a visitor. Visitors may choose to submit personal information online to enter contests, to obtain information or submit a comment, to register for a loyalty program or MyTournamentSpace, the Spirit Center, or to place an order. We may also obtain contact lists, demographic, and other information from other sources. For the convenience of our customers and to better serve you, we combine the data. You can update or correct your contact information or change your preferences about receiving offers and information from us at any time. Our web sites DO NOT contain content for visitors under the age of 13. Please see more detailed information in our Terms of Service. We collect personally identifiable information to enter you in contests and notify you of results, to e-mail you with updates and news, to respond to your questions or comments, to register you for certain features, to provide personalized content, information, and/or to send out brochures, coupons, offers and other information on our products or our company. We ask visitors providing e-mail addresses to let us know if they would like further information or updates from us or our site; only those who request it will receive follow-up e-mail or other communications from us. We may also ask if you would like to receive information about other products available from members of our family of companies. Only those who expressly ask to receive such information online will get it. If we are not sure of your preferences we may ask you about them. We also offer visitors an “opt-out” option at any time they wish to cease receiving e-mails or other information from us. Sometimes our Tournament Clients (“Events”) will make offers, coupons and information, including catalogues, available to you via mail. For example, when customers place an online order in our catalogue stores or sign up for one of our catalogues online we may add them to the list to receive that catalogue. Our Events may also use lists we have received from third parties or public sources to send you this information, and, as is routinely done in the catalogue business, may exchange names and addresses (but not e-mail addresses absent consent) of our catalogue customers with other catalogue companies who may also contact you by mail. You may “opt-out” of receiving offline communications from our Events at any time. Personal information is used solely by us, and our affiliates, agents or events who help make this site and its content and the products and services at this site, available to you in order to respond to your requests (like fulfilling online shopping orders or offering a sweepstakes or promotion), and to better serve you, consistent with this policy. Data may be shared or combined between current or future affiliates, subsidiaries or other related entities of our company to enhance efficiency and minimize duplication of contacts with you. In addition, we may occasionally ask you if we may share information with other trusted third parties. We will let you know at the time the information is collected if such third-party sharing is anticipated, will identify the types of businesses at the area of collection, will describe the information we will share (like your mail or e-mail address) and will only share data if you agree. We will share personal data only with those who have agreed to follow careful policies. TourneyCentral DOES NOT use Team Application Data without the express, written permission of the event under whose web site it was given. For example, if you applied to the “Ultimate Cup” in Scottsdale, AZ, the Ultimate Cup owns that data and TourneyCentral.com will not use it for purposes other than goods or services specific to the Ultimate Cup. Likewise, the event MAY NOT share your information directly with its advertisers or partners, though they may send out offers, notices, etc. on their advertisers’ behalf, using the broadcast tools available to the event. How do we use “cookies” and Web beacons? Visitors to our sites use different web browsers and different computers. To make your visits as easy as possible with the technology you use, we automatically keep track of the type of browser (e.g., Internet Explorer, Netscape) and operating system (e.g., Windows, Macintosh) used by a visitor, and the domain name of the visitor’s Internet service provider. We also track the total number of visitors to our site in an aggregate form to allow us to update and improve our site; personally identifiable information is not extracted in this process. This data tells us if more visitors prefer certain features or areas to others, which helps us keep our site fresh and interesting to the majority of our visitors. We don’t use web beacons. We care about the safety and security of your transaction. We only link processors who use SSL (Secure Sockets Layer) SSL is the industry standard security protocol, which makes it extremely difficult for anyone else to intercept your credit card / transaction information that you send us when you submit your online order. All payments are processed on the payment processor’s website. TourneyCentral collects and stores personal information about its users to customize their tournament experience. It shares minimal data with its service providers. In order to provide the services, TourneyCentral collects and stores personal data about its users on the legal basis of consent given when you apply to an event. Where TourneyCentral collects and stores personal data about non-users, it does so under performance of contract obligations with users who use the services to participate in events hosted by TourneyCentral. In such cases, users authoring such content containing personal data of third parties are responsible for that content. TourneyCentral will consider related complaints in compliance with the General Data Protection Regulation’s rights of the data subject, as well as rights of expression and access to information. Users may choose to interact publicly with the TourneyCentral Services in the form of viewing content. Where such personal data may reveal special category protected data, it is processed on the basis that it is manifestly made public by the user. Additional information on potential consequences of such processing can be found below. If you do not agree to this public usage, do not apply to an event or use the event websites of TourneyCentral. Search engines will index teams, scores and schedules. Users may also share links to your content on social media. TourneyCentral provides Services in conjunction with several payment processors, including: Paypal, Square, CardX and Authorize.net, through which users may pay for event application fees. Those companies acting as payment processors may collect and store personal data related to your billing information and history in order to provide their services, and may collect and store personal data and business data to prevent fraud and other abuse. No credit card data is retained by TourneyCentral except the status of whether or not the application fees are paid. When you delete your TourneyCentral-event application, TourneyCentral deletes your personal data as outlined in this document. However, to delete your payment or billing information, you will need to do so with your payment provider, as TourneyCentral only has minimal secure access to those records as needed to provide the services. 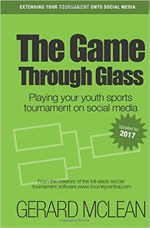 TourneyCentral posts may contain third-party embeds, which may in some cases collect and store personal data. The use of personal data by embedded content providers is not covered by this statement, but by the privacy policies of those sites or services. No AI is used on the event sites. By applying for an event, users may make certain personal data about themselves public and accessible to others on their profile and through network interactions. This may in some cases constitute special category protected data which is considered manifestly made public by the user. Due to the public nature of information posted to TourneyCentral, it may be possible for third parties to derive identifying personal data, whether by reading, inference, supplemental research, or automated extraction and analysis. TourneyCentral is hosted in the United States. By using TourneyCentral Services, you authorize TourneyCentral to transfer, store, and use your information in the United States and any other country where we operate. Where your data is disclosed to our processors, it is subject by contract to at least the same level of data protection as that set out in this statement. TourneyCentral retains team data associated with your application for the lifetime of your account. If you would like to delete your team information, you may request to helpdesk@tourneycentral.com. Your team name and location will be retained, however, so that the event can maintain a complete game schedule. It may take several additional days for your personal data to be de-indexed from search engines, depending on those search engines’ practices, over which TourneyCentral may have limited or no control. If you apply to an event hosted by TourneyCentral, you may at any time request an export of your information by logging into your team page. You may correct information associated with your application from the Log in page. You may withdraw consent by deleting your application at any time, which will erase your personal information completely within 14 days (except to the extent TourneyCentral is prevented by law from deleting your information). Erasure of your data may result in withdrawing your team from event participation. You may object at any time to the use of your personal data by contacting the tournament event through the Contact Us at the bottom of their event site. If your complaint relates to alleged misuse of your personal data by a third party, it may result in suspension of that application in keeping with relevant law, public interest, our contractual obligations, and the rights of expression and access to information of others. You may at any time lodge a complaint regarding the processing of your personal data by TourneyCentral with the Supervisory Authority of your EU member state.